September 27, 2012 — Washington D.C. Entire post-dinner program, including the four annual awards, "William F. Buckley Jr. Award for Media Excellence," "funny clips" and the selection of the "Worst Reporter in the History of Man Award." Chris Plante, Laura Ingraham, Steve Hayes, Jonah Goldberg, Cal Thomas, Tony Perkins, Reince Priebus, Marjorie Dannenfelser, Lynn and Foster Friess and a performance by The Davisson Brothers Band, highlighted the MRC's "25th Anniversary Gala featuring the DisHonors Awards: Roasting the Most Outrageously Biased Liberal Reporting," presented on Thursday night, September 27, before a boisterous audience of one thousand at the National Building Museum in Washington, D.C. In addition to the presentation of the DisHonors Awards videos in four categories and a look at some "funny clips," the audience assigned the "Worst Reporter in the History of Man Award." MRC President Brent Bozell led the audience in watching compilations of the most obnoxious bias from Dan Rather, Bryant Gumbel, Katie Couric and Brian Williams. He then asked the audience to show their derision via jeers and noisemakers and, after a head-to-head comparison of audience opinion toward Couric and Rather, Couric was declared the clear winner. The MRC also honored the late Andrew Breitbart with the MRC's sixth annual "William F. Buckley Award for Media Excellence." Cal Thomas, who earned the honor in 2011, presented the award to Breitbart's father-in-law, Orson Bean. DisHonors Awards winners were selected by a distinguished panel of 12 leading media observers, including Ann Coulter, Monica Crowley, Lou Dobbs, Mark Levin, David Limbaugh, Rush Limbaugh, Walter E. Williams and Thomas S. Winter. Before dinner, Chris Plante welcomes the audience, Father Terence Henry provides the invocation and Marines in Afghanistan, via video, lead the pledge of allegiance. Chris Plante, a talk show host on Washington, DC's WMAL, served as Master of Ceremonies. Laura Ingraham, a nationally-syndicated talk radio host and the principal substitute host of The O'Reilly Factor, presented the first two awards; followed by Weekly Standard senior writer and Fox News contributor Stephen Hayes who handled the "funnies," and National Review Online founding editor Jonah Goldberg, who presented the third and fourth award categories. To mark the MRC's 25th anniversary, each award category was introduced with a "through the years" video retrospective of the worst bias on that topic over the MRC's first 25 years. In place of the journalist who won each award, a conservative accepted it in jest. Those standing in for the winners: Reince Priebus, Chairman of the Republican National Committee; Tony Perkins, President of the Family Research Council; Marjorie Dannenfelser, President of the Susan B. Anthony List; and conservative philanthropists Foster and Lynn Friess. MRC President Brent Bozell's remarks on the MRC's 25th anniversary and Karl Ottosen, of the MRC's Board of Directors, honors Bozell's achievements with a toast and introduces Dr. Seymour Fein, Chairman of the MRC's Board of Trustees, to present a plaque commemorating his 25 years leading the MRC. The evening began with an invocation by Father Terence Henry, President of the Franciscan University of Steubenville, Ohio. Dr. Seymour Fein, Chairman of the MRC's Board of Trustees, came on stage to lead the Pledge of Allegiance, but instead directed the audience to a video from Marine Captain Joseph Bozell in Afghanistan whose squad recited the pledge. When Bozell came to the podium for the "Worst Reporter in the History of Man," he was soon interrupted by Karl Ottosen of the MRC's Board of Directors. He introduced Fein who presented Bozell with a plaque commemorating his 25 years leading the MRC. Chris Plante opens the gala program, then Laura Ingraham presents "The Obamagasm Award," won by Chris Matthews and accepted in jest by Reince Priebus. A video compilation of the media's worst "media hero worshipping" bias over the Media Research Center's first 25 years, as played to introduce "The Obamagasm Award." "We thought we'd bring you up to date on those protesters, the Occupy Wall Street movement. As of tonight, it has spread to more than 250 American cities, more than a thousand countries — every continent but Antarctica." — Diane Sawyer on ABC's World News, October 10, 2011. On a later edition, Sawyer corrected her still-absurd hype: "...more than a thousand cities around the world." "When you watch the President like that, I always feel he's got so many pluses, doesn't he? In a sense, he's personable, he's handsome, he can be funny. You know, abroad he has this great image for America. A lot of things are just perfect about Barack Obama." — Piers Morgan to Obama strategist David Axelrod, CNN's Piers Morgan Tonight, December 5, 2011. "This guy's done everything right. He's raised his family right. He's fought his way all the way to the top of the Harvard Law Review, in a blind test becomes head of the Review, the top editor there. Everything he's done is clean as a whistle. He's never not only broken any law, he's never done anything wrong. He's the perfect father, the perfect husband, the perfect American. And all they do is trash the guy." — MSNBC's Chris Matthews talking about President Obama on Hardball, July 17, 2012. Laura Ingraham presents "The Vast Right-Wing Knuckle-Draggers Award," won by Thomas Roberts and accepted in jest by Tony Perkins. A video compilation of the media's worst campaign coverage bias over the Media Research Center's first 25 years, as played to introduce "The Vast Right-Wing Knuckle-Draggers Award." "These seem to be appeals to the extreme white wing of the Republican Party. That is to say that there continues to be among many conservatives a real resentment against blacks....I think it is part of a hateful campaign that is being very methodically run in the hope it's going to appeal to voters who would love to see us return to the good old days of Jim Crow." — Former CNN correspondent Bob Franken talking about the GOP candidates on MSNBC's PoliticsNation, January 6, 2012. "The utter confusion in the Republican presidential nominating process results from two discernible facts. One: they hate. That's the simplest explanation of the disastrous course of this selection process. They hate so much they are not in the mood to fall in love with a candidate or even fall in behind someone. Their brains, racked as they are by hatred, they lack the 'like' mode. They are in no mood to go around looking a politician they like. The hating is so much more satisfying." — MSNBC's Chris Matthews on Hardball, November 15, 2011. "I get out of all of these things that many of these candidates would rather take legislation to build a time machine and go back in time to where we had, you know, no women voting, slavery was cool. I mean, it's just kind of ridiculous." — Daytime anchor Thomas Roberts on MSNBC Live, September 23, 2011 talking about the previous night's GOP debate. Jonah Goldberg presents the "Damn Those Conservatives to Hell Award," won by Ann Curry and accepted in jest by Marjorie Dannesnfelser. A video compilation of the media's worst attacks on conservatives over the Media Research Center's first 25 years, as played to introduce the "Damn Those Conservatives to Hell Award." "He [Mitt Romney] is playing to — and has from the beginning of the campaign — played to the kind of nativist base of the Tea Party. And by nativist, I mean people who are, in essence, afraid of the world....The Republican Party is going to cripple itself beyond recognition if they don't quit being xenophobes." — Ex-Newsweek chief political correspondent Howard Fineman, now a Huffington Post columnist, on MSNBC's Hardball, July 23, 2012. "Limbaugh's disgusting comments are the work of an archaic old dinosaur living in a warped, ugly swamp, who thinks it's okay to degrade decent young women for sport and ratings. Well, it isn't. Shame on you, Rush Limbaugh." — CNN's Piers Morgan wrapping up his Piers Morgan Tonight, March 2, 2012. "The Center of [sic] Budget and Policy Priorities says, you're smiling because you know about this, says 62 percent of the savings in your budget would come from cutting programs for the poor, that between eight and ten million people would be kicked off of food stamps, that you would cut Medicare by $200 billion, Medicaid and other health programs by something like $770 billion. Where is the empathy in this budget?... Do you acknowledge that poor people will suffer under this budget, that you have shown a lack of empathy to poor people in this budget?" — Co-host Ann Curry to U.S. Representative Paul Ryan on NBC's Today, April 10, 2012. Jonah Goldberg presents "The Barbra Streisand Political IQ Award for Celebrity Vapidity," won by Sean Penn and accepted in jest by Foster and Lynn Friess. A video compilation of the silliest proclamations by celebrities over the Media Research Center's first 25 years, as played to introduce the "The Barbra Streisand Political IQ Award for Celebrity Vapidity." Piers Morgan: "Has Obama helped the process of eradicating racism, or has it in a strange way made it worse?" Actor Morgan Freeman: "Made it worse. Made it worse. Look at, look, the Tea Partiers, who are controlling the Republican Party. Their stated policy, publicly stated, is to do whatever it takes to see to it that Obama only serves one term. What's, what does that, what underlines that? 'Screw the country. We're going to whatever we do to get this black man, we can, we're going to do whatever we can to get this black man outta here.'" Piers Morgan: "But is that necessarily a racist thing?" Morgan Freeman: "It is a racist thing." — CNN's Piers Morgan Tonight, September 23, 2011. "The day after the 9/11 attacks, the number one priority in America, if not the world, was we've got to get bin Laden, we've got to get bin Laden. So eight years go by, we still haven't got bin Laden. George W. Bush at one point said, well, he doesn't really think too much about bin Laden. In the interim, we invaded Afghanistan then we invaded Iraq because Cheney wanted to help out his buddies at Brown and Root and Halliburton....and grab up all the oil. I think that they went soft on the project because they were worried about upsetting their Saudi Arabian royalty buddies. So now Osama bin Laden finally is gunned down by Barack Obama, displaying great courage and great intelligence. What more do you want to lead your country than that kind of courage and that kind of intelligence?" — Host David Letterman to NBC Nightly News anchor Brian Williams, May 15, 2012 CBS Late Show. "You have what I call the 'Get the N-word out of the White House party,' the Tea Party.... At the end of the day, there's a big bubble coming out of their heads saying, you know, 'Can we just lynch him?'" — Actor Sean Penn on CNN's Piers Morgan Tonight, October 14, 2011. MRC President Brent Bozell played for the audience highlights of the worst bias over the years from Dan Rather, Bryant Gumbel, Katie Couric and Brian Williams and then called to the stage all the presenters and acceptors so they could judge, based on the audience's jeering, which of the four deserved the "Worst Reporter in the History of Man" rebuke. Katie Couric was the clear choice. A video compilation of the most obnoxious liberal bias by Dan Rather over the Media Research Center's first 25 years. A video compilation of the most obnoxious liberal bias by Bryant Gumbel over the Media Research Center's first 25 years. A video compilation of the most obnoxious liberal bias by Brian Williams over the Media Research Center's first 25 years. A video compilation of the most obnoxious liberal bias by Katie Couric over the Media Research Center's first 25 years. 6th Annual William F. Buckley Jr.
Fifty-nine years ago, William F. Buckley Jr. circumvented the liberal media's "Berlin Wall" of bias with imagination and tenacity. His intellectual progeny now populate the airwaves and cyberspace, leaving the old liberal media in the dustbin of history. 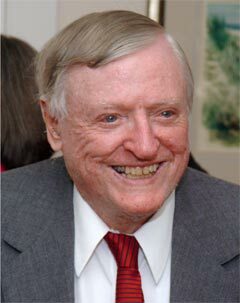 To recognize and honor the very best of these new conservative leaders, the Media Research Center is proud to present the annual William F. Buckley Jr. Award for Media Excellence. The MRC honors the late Andrew Breitbart with the MRC's sixth annual "William F. Buckley Award for Media Excellence." Cal Thomas, who earned the honor in 2011, presents the award to Breitbart's father-in-law, Orson Beane. A video montage, of the distinguished panel of 12 judges for the "DisHonors Awards," played during the MRC's 25th Anniversary Gala. Steve Hayes presents the "best of archived funny clips" and ones from this year drawn from comedy shows and humorous clips shown at the end of FNC's Special Report.